Britain could not withstand a military attack from Russia, according to the former head of the Royal Air Force (RAF) Sir Michael Graydon. The warnings follow an incident on Thursday when RAF Typhoon fighter jets were scrambled to intercept two Russian long-range bombers in international airspace off the coast of Cornwall. Russia’s Defense Ministry said the flight was a planned air patrol conducted in accordance with international law. While Prime Minister David Cameron rebuffed the incident as Russia “trying to make some sort of point,” Graydon believes the threat is more serious. “They fly in these regions to check our air defenses and have probably worked out we are not as sharp as we were. “They know it is provocative and they are doing it at a time when defense in the West is pretty wet compared to where they are,” he added. Air Commodore Andrew Lambert echoed Graydon’s comments, claiming the UK “couldn’t cope” in the event of a Russian attack. “If Putin wanted to attack, he would not send a pair of bombers, he would send the lot and saturate our defenses; we couldn’t cope,” he said. “The Typhoon is a really good aircraft but with their relatively small numbers they would be overwhelmed: the Russians would outflank us, go around us or just go through us. “The modern generation of politicians has grown up in absolute security – they’ve never felt a threat to their existence, safety or security. They’ve taken peace for granted and decimated the Armed Forces. Let’s hope we don’t pay the price,” he added. The RAF’s interception of Russian bear bombers on Thursday follows a similar event in January, when two Russian Bear bombers flying close to UK airspace were intercepted by RAF Typhoons. The UK Foreign Office summoned the Russian ambassador at the time to lodge a complaint about the flight of Russian military jets over the English Channel, which authorities claimed posed a danger to passenger aircraft. However, no details were given to prove how the bombers posed a danger. 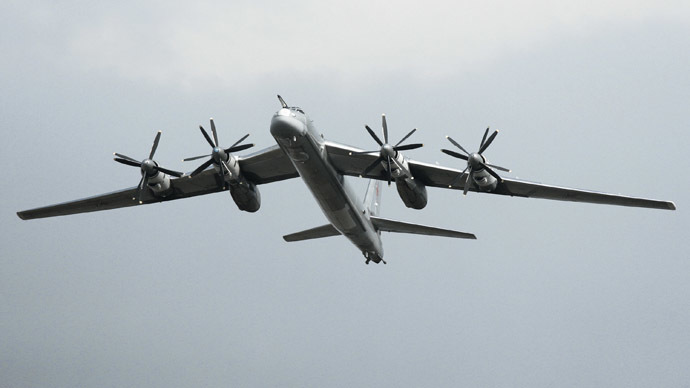 Two TU-95 ‘Bear’ bombers took off from Engels airbase on a flight path which took them above “neutral waters in the Barents and Norwegian seas of the Atlantic Ocean,” according to the statement.